I get asked this question a lot! 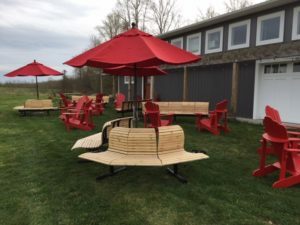 While admittedly we can spend the whole winter season in the one set of work clothes and we don’t have to brush our hair as often we’re still as busy at the cidery as during the summer. In fact it sometimes seems more frantic, but however hard we work there is still that massive list of must do items in the week before we open – really what have we been up to all winter??? As soon as we close our doors at Thanksgiving, the apples and juice start to arrive. That first month is spent pressing, and fermenting. Fermentation is pretty much done by January and then its on to the racking (where we remove the cider from the yeast and lees layer) and putting everything into clean totes to mature. We had some pretty savage days this January during the racking with minus temperatures. Productivity takes a dive when you have to spend the first couple of hours digging your way through the snow to the cidery and then not only is the equipment cold and the hoses hard to handle but the slightest spill of water instantly freezes and turns to ice on the concrete floor. Its really tough to push a 1,000kg tote of cider around when you’ve got no friction to push against and ice skating was never my sport of choice. Bottling the cider starts at the beginning of March and until we open we bottle twice a week. The cidery starts to fill up with new product until we’re absolutely bursting at the seams by the beginning of May. In addition to actually making the cider, we take the opportunity to catch up on all the little jobs that we didn’t get time to do during the summer. Equipment gets repaired and serviced, improvements to our production and set-up are made. This year’s purchase is a new automatic labelling machine which is making the staff very happy and has significantly reduced the potential for repetitive strain injuries. We’re also investing in some new large capacity tanks to store our finished cider which should be arriving in early May. 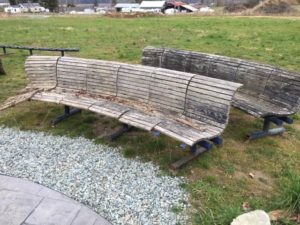 Our big project this year was refurbishing some new benches for our picnic area. These benches were left on the property when we originally bought it and the rumour is they were used in Expo 86. We stripped them down, gave them a spray of fresh paint and cut new wood to replace the old rotted seating. 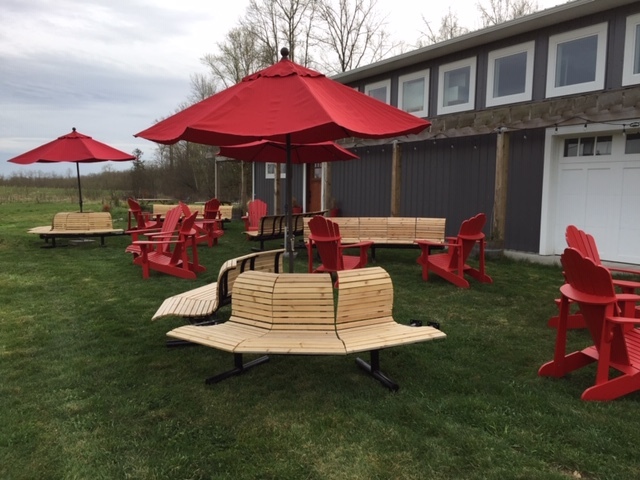 We think they look pretty amazing in the new casual layout picnic area! Outside in the orchard there are trees to prune, new trees to graft and plant and year old trees to get established in the orchard. As soon as the weather warms up the grass seems to take off and then its always a race to get it mowed before it reaches head height and you can’t see where you’re driving the tractor anymore. And then after the physical work is done during the day there are evenings at the computer, planning events, registering for farmers markets, new website designs, researching equipment, paying the bills and the endless government forms and reports to fill out. So now you know what goes on behind that “Closed for the Season” sign – its a hive of activity. Now if you’ll excuse me, I have a cidery to open in a couple of weeks and a great big long “to-do” list to finish. I suppose I should find time to brush my hair and hunt out some reasonable clothes at some point too!